The Potomac Nationals (9-11-Overall, 5-4-Road) never recovered from a four run first inning orchestrated by the Winston-Salem Dash (10-9-Overall, 4-4-Home) and fell for the fifth straight time 6-3 to drop the series on Wednesday afternoon at BB&T Ballpark. The ace of the P-Nats staff RHP Wander Suero (3-1, 3.60) took the ball for the fourth time in 2015 looking to play the stopper in Winston-Salem. Opposing Suero was the lefty Jace Fry (1-3, 2.49), making his fourth start of the campaign for the Dash and trying to pitch Winston-Salem to a series victory at home. The ballgame began ominously for Potomac when they were retired one, two, three by Fry in the top of the first. The bottom of the first marked the worst inning of baseball turned in by the P-Nats this season. With one out 2B Jake Peter reached on a tough error charged to 3B Drew Ward on a hard hit ground ball that put a runner on first base. Ward’s counterpart 3B Trey Michalczewski lined a triple into right field that scored Peter for a 1-0 Dash lead. 1B Keon Barnum walked, DH Chris Jacobs hit a bloop single into shallow right field that brought home Michalczewski for a 2-0 Dash lead. LF Nick Basto then walked to load the bases and SS Cleuluis Rondon fielder’s choice reloaded the bases due to a throwing error by 1B John Wooten that allowed Barnum to score for a 3-0 Dash advantage. RF Keenyn Walker hit a RBI fielder’s choice to the plate the fourth and final run of the inning for a 4-0 Winston-Salem lead. In total there were two hits, two walks, and two errors in the first frame. The score remained 4-0 Dash until the bottom of the third when Suero walked Barnum to begin the inning. Jacobs came to the plate and crushed a pitch over the wall in left field for a two-run home run, his first of the year and his second and third RBIs on the day and it gave Winston-Salem a 6-0 lead. Suero didn’t make it out of the third inning. He issued two more walks before being lifted from the ballgame in favor of RHP Cody Davis. Suero lasted two-plus innings and allowed six runs (three earned) on four hits, five walks and he struck out one, taking his first loss of the season. Potomac’s offense mustered just two hits through the first five innings against Fry. It wasn’t until the top of the sixth when CF Narciso Mesatripled, his first of the season, to begin the inning. DH Isaac Ballou followed with a two-bagger that scored Mesa and made it 6-1 Dash. Ballou turned in another three hit afternoon, including two doubles, and now has eight hits over his last three games. A Wooten groundout moved Ballou to third and he came home to score on an RBI groundout by RF Brandon Miller to cut the lead to 6-2 Winston-Salem. Fry was delightful in the start, pitching seven innings, he was dinged for two runs (both earned) on four hits, two walks and he struck out four. Fry, at long last, picked up his first win of the season. Wintson-Salem dipped into their bullpen in the seventh and brought in LHP Andre Wheeler, who gave up a run in the eighth inning. A lead-off walk to LF Estarlin Martinez was followed by a one out single by Ballou and a sacrifice fly for Wooten to make it 6-3. Wheeler came back out and pitched a scoreless ninth inning to close out the 6-3 game and pick up the fifth win in a row for Winston-Salem. Davis, out of the Potomac bullpen logged four shutout innings in relief of Suero, allowing just two hits and he struck out one batter. LHP Nick Lee pitched two scoreless innings to end the ballgame on a strong note for the P-Nats bullpen. Tomorrow’s Game Three is a 7:00 pm first pitch from BB&T Ballpark and features RHP Dakota Bacus (0-0, 4.50) for Potomac vs. RHP Robinson Layer (0-2, 4.20) for Winston-Salem. 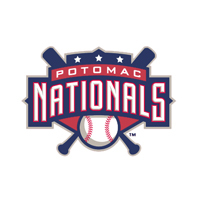 The “P-Nats Lead-Off Show” will begin the broadcast at 6:45 pm and take you up to first pitch and you can listen live at www.potomacnationals.com and via the TunIn Radio App.